15 September 2008 will be remembered as one of the saddest days of our lives. elvis, our superstar, was taken too early from us, at the age of 8. an ordinary day started with 5 happy huskies leaving the bedroom and ended with us finding one sunbathing in the dog run with no pulse. a tumour in his heart had brought on a sudden fatal heart attack without any warning. he leaves us with 8 years of amazing memories. we’ve had many emails and messages from far and wide about elvis. he touched so many people with his kind ways and tom-foolery. Recently the saddest news was that Guy and Helen Redwood have lost Elvis. This really pulls at the heart strings since he was so young. He had been trying for so long, finally succeeding, to win his title. That made him a familiar figure at shows yet he was not over shown. His final tally was five CCs and eight RCCs – he really did himself proud. It was very much a case of when he crossed the line he became very much recognised as a nice example of the breed. It is pointless trying to understand the loss that is felt on an occasion like this but, as I have mentioned to Guy and Helen, they must cherish all those happy memories. We send them our sympathy. The reality of his departure is still dawning on us. Helen has lost her champion show dog and I’ve lost half of my 2 dog race team. the arkward reality of husky ownership has meant our grief has eased and almost swept away by the four bundles of joy we have around the house. all I can do is celebrate my elvis with a smile from a memory and cuddle from his mates Teba, Baloo, Basil and his special soulmate Mookie. This entry was posted in Rainbow Bridge, Siberian Huskies and tagged elvis on October 7, 2008 by Guy Redwood. the trip up to Scotland on Sunday was certainly worth it with Elvis gaining his 4th CC and winning BIS at the first SSHC Championship Show. his sister Pearl, CH Huskidoo String of Pearls, was RBIS. it was great to end our show season on such a high note. guy spent the day at home kitting out the van which is coming along now, so hopefully it won’t be long before the cages are finished. This entry was posted in Helen, Showing Huskies and tagged BIS, CC, elvis, SSHC on October 10, 2006 by Guy Redwood. Elvis came third in the SHCGB Dual Championship this year, announced at the club AGM on Saturday. This is one hell of an achievement. You only have to stand on the back of rig, watching him work, to comprehend what a good Siberian Husky is all about. I do think that judges should be made to take a team of huskies out to experience what it’s all about. It just makes sense when you see a dog like Elvis working without effort and then compare it to another that’s trying but just isn’t built for it. Anyway, it’s that time of year where we pick our shows and dream of winter. We’re aiming to do less showing this year. I want to spend more time at home and enjoy a little more of Summer in the garden. Last month, the rally season came to close with a fabulous rally in Scotland. John Carter invited the husky club up onto his land giving us an amazing set of courses with lots of turns, bumps and hills. The rally attracted a great bunch of people, who hit the town on Saturday night for a quiet meal with a few drinks. The club goes from strength to strength, and our collection of husky friends continues to grow. 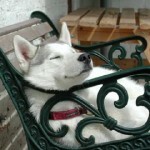 There’s some really nice people out there in the husky world and life’s too short not to enjoy them. This entry was posted in Husky Club, Racing Huskies and tagged Dual Championship, elvis, SHCGB on April 25, 2004 by Guy Redwood.